Focused on tomorrow. Focused on every tomorrow. Apache proudly celebrates nearly a century of sustainability leadership in Cochise County. From our earliest steps to help minimize our impact on the environment—such as recycling, carpooling, reducing waste and investing in renewable energy sources—Apache has expanded our sustainability policies into a corporate-wide philosophy. 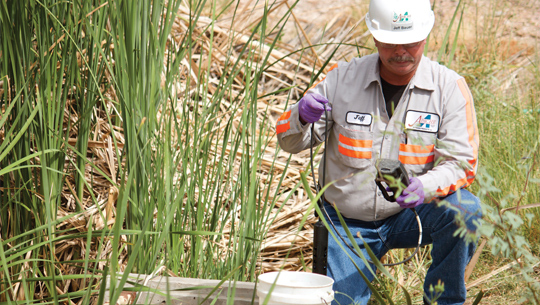 And it's not just talking the talk, because we actively support our employees' sustainability efforts. A commitment we stand by, every day. Apache's commitment can be summarized in what we call our three tenets of sustainability: People, Planet and Profitability, each an integral part of our triple bottom line. Safety is unquestionably the top priority throughout our organization, but those three pillars of sustainability come right behind in importance. Every major company decision is evaluated and weighed with them in mind. We have developed many industry-leading policies and protocols to help protect the earth and sustain its precious resources, but we also know we need a successful business to feed our families, support our communities and serve our customers. Our sustainability tenets determine the courses of action that are best for everybody...both now and for years to come.